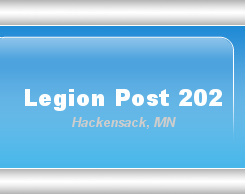 American Legion Post 202 is nestled in beautiful downtown Hackensack, gateway to the Chippewa National Forest with access to over 120 lakes within a 15 mile radius. Located right on the Paul Bunyan trail. Plenty of free parking for staging for biking, skating, hiking and snowmobiling. Come visit us, have a drink, play some pool, darts, pull-tabs, eat dinner or just hang out.